Have you watched Harry Potter 7 Part 1 - The Deathly Hallows? We watched the movie on Friday afternoon. The theater was full but hubby was so smart to buy the tickets for us ahead. Audrey was enjoying the movie while Andrew was bored after half it. My kids never watched the Harry Potter moview (1-6) at the cinema before. So it was always only me and my husband. But I have the Harry Potter DVDs collection at home and my kids were having Harry Potter movie marathon (1-3) on Saturday. Inspired by the movie, I browsed the internet and found the cute Harry Potter cartoon here. I used egg sheet to re-create the character although I couldn't create as details as the original cartoon because of the time limitation. But I think I'm happy with it. I hope everyone had a great time on the weekend. I have one good news to share. 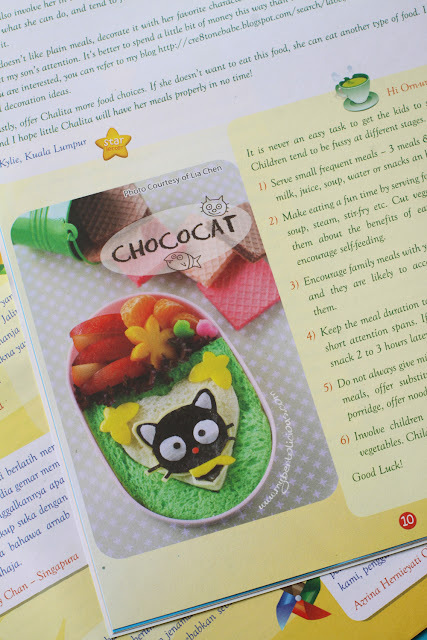 One of my bento pictures has been featured on newsletter from SCA Hygiene Malaysia Sdn Bhd (picture shown below). The company asked me whether they could use one of my bento pictures for their company newsletter and I didn't have any objection on that. In fact, I love they asked for the permission first which showed their appreciation for my bento pictures. Thanks to Jasmine and Sherin to send me a complimentary gift. I was surprised to receive that on last Friday. Now thinking about Christmas, thinking about when I should start making Christmas theme bento. Maybe I will start tomorrow, school break is coming soon. So I will try to find some ideas for that tonight. wow congrats on the feature, that's awesome! As is the harry potter bento. Which parts are nori? Aw, this Harry Potter is so cute! As child, I loved the Harry Potter books. But I only read up to No. 6. I don't watch the movies, but your Harry is really really great ^-^ Beautiful bento! Lia, you are the GREAT bento maestro! I really admire the amazing things that you can do with the egg sheet. I really could use some lesson from you. @Rio : Thanks a lot Rio for your kind comment! @KidsDreamWork : Thanks a lot Ai Ping! I am excited too for the Christmas theme bento in our bento world, yeay!! Congratulations for the bento feature in the newsletter! Great job. ckckckckck....itu harry potter-nya lucuuuu bgt!!!! itu warnain egg sheetnya pake apa mbak?kok coklatnya bisa ad yg tua ad yg muda? Love this Harry Potter, so cute! oh your Harry Potter is so cute !!! In France the movie will be on theater Wednesday, I'll see it this week end with my boyfriend! I hope it will be great ! And congratulations for your bento in the company's newsletter ! Lia.. you are the egg sheet expert. The Harry Potter is perfect and cute! Omigosh if you had more time to make it... he is perfect like that already! Congratulations on your featured bento photo! That is fantastic! Your Harry Potter is amazing! You have a wonderful talent for creating characters with egg sheets, I love seeing your art. I can't wait to see what comes next!! WOW!!! Congrats on the feature!!! thanks for the reply. i thought it was just me missing something haha. Whenever i try with the xacto knife it always comes out jagged. You do such a wonderful job! Do you put the picture over the egg sheet and then trace around it? Congratulations on the photo! It looks great, and I bet more people will be inspired to try bento. I also made a Harry Potter bento, but yours is light years better than mine. Maybe mine needs more training at Hogwarts. Ha ha! Wow, what a great looking Harry Potter! We haven't seen the new movie yet and will probably wait until in comes out on video - going to the theatre is very costly where we live. It has been fun though, listening to everyone's comments about it! Congrats on the feature and this outstandingly cute and skillful bento! You are a superstar in the bento world, inspiring us with your creations. So great, Lia!! @Sonoma Bento : Thanks a lot Michelle! I hope more and more people will try to make their own bento and throw away their negative thinking about bento. 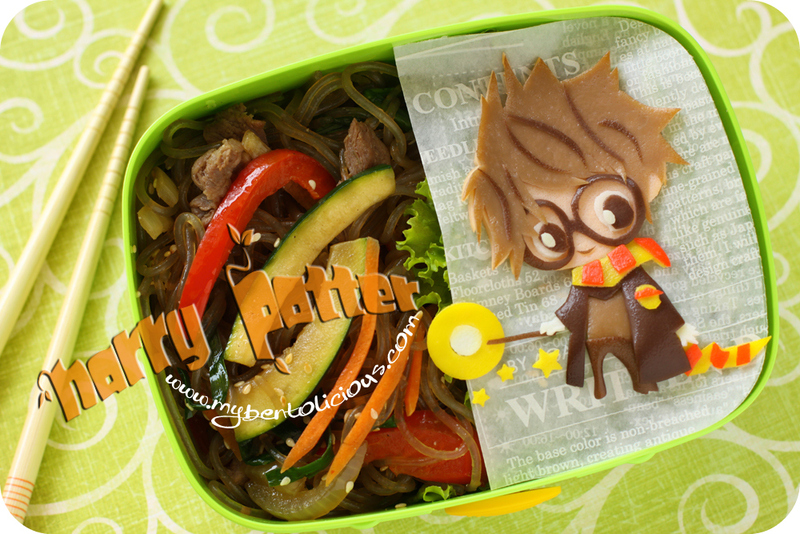 I love your 3D version of Harry Potter bento, so cool! wow! This is a cute Harry Potter! I enjoyed the movie very much! We have been following the Harry Potter movie too. Can't wait til part 2!! wow.. I am big fan of Harry Potter too.. I watch all the movie. But this time I might have to get the DVD. Never step into a cinema after my elder is born.. haha. Love the cute Harry bento, now he has grown up, so kinda miss him in the ealier episodes. and just curious, the face also made of egg sheets? and how u make that colour? sometimes i am still no clue on how to mix the correct colours. wow cute lovely Harry Potter mba lia. Congratulation for your first international debut on Malaysia newsletter. @Vanessa : Thank you so much Vanessa! Lia, Congrats on the bento feature! Totally cool. For this Harry Potter bento? I am BLOWN AWAY!! Whoa. That is the cutest Harry Potter ever. So freaking cool!! I don't know how you do these but soooo cool! You need to do a book. I wanted to see the movie yesterday on my day off but it was rainy and I was still so tired. Maybe next week. Kids.. they are so used to seeing everything these days. lol! Congrats on the feature and superb job on the cute Harry ! We saw the movie last sat and it was the first Harry movie for my kids too. Son love it but my girl said it's scary ! congrats! this is such a cute harry....now that the actors've all grown up compared to the 1st movie. @SIG : Thanks a lot Debra! @Pristy : Thanks a lot Pristy!